Whether you have just come from a hard day at work and are kicking your shoes off, or you are finally done running the kids around for the day, your home is the one place where your free time and sense of security are most important. The last thing you will want to do is get back up and answer that door. Of course, it is even more frustrating when it’s a stranger trying to sell you magazine subscriptions, instead of the pizza boy delivering your much anticipated dinner. Now you won’t even have to get up when answering the door. Allowing access to your home is now as simple as pushing a button. Give yourself some piece of mind, and added convenience, with the new Cyrex Hands-Free Video Intercom System. This system allows you to see who’s ringing at your door, and allows you decide if you need to, or more importantly, if you want to get up and answer it. The CYREX HFX-800M allows you to answer the door from the comfort of your couch, kitchen or anywhere in the house. Would you like to view entrances of your home via any video monitor on your system? 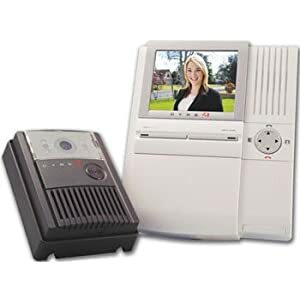 With the new Cyrex Hands-Free Video Intercom System, you have access to one of the most cost effective intercom systems, which is also loaded with features! The cameras weatherproof plastic door bell housing holds the 1/3” camera that provides full color pictures during the day. Worried about night visitors? CYREX HFX-800M Intercom System is equipped with built-in LED’s that provide extra-lighting in order to enhance night viewing, all of which are controlled by a state of the art CCD chipset. With a simple 2 wire installation, full motion video/audio recording, and expandability up to 4 monitors and 2 cameras, this intercom system is the smart choice. Forget about systems that only take snapshots! CYREX HFX-800M records full motion video and audio when the door bell is activated. This feature lets you know who was at your door while you were away. Clips recorded by CYREX HFX-800M are stored on a standard SD card that can be retrieved via any desktop PC. With a remote door release and the ability to install the 4” monitors and door bells throughout your home, your peace of mind can be purchased; at a great price! CYREX HFX-800M Intercom System is the most efficient and logical choice in order to give your relatives and friends a warm hi-tech welcome to your home, and be able to keep track of who is knocking on your door. With total controlled access to your home, convenience will always be at hand. Purchasing the CYREX HFX-800M has never been easier. Just browse HPI's product page, and you’ll be surprised at all the features the CYREX HFX-800M can perform for you! HomeProductsInc is one of the leading suppliers of electronic devices and technology solutions online. Just place your order and your CYREX Intercom System can be shipped to your doorstep within days!